SSE 90 INC is an Ontario Recognized Academy(ORA) and is a member of the Ontario Soccer Association(OSA) and the Canadian Soccer Association(CSA). 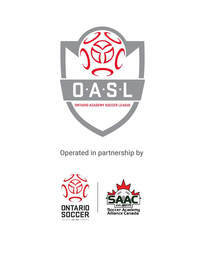 All of our Academy REP teams will play in the Ontario Academy Soccer League(OASL) in 2018. SSE 90 is looking for girls born in 2007 and 2006 to be a part of their Under 12 Academy REP Team for the 2018 outdoor season. SSE 90's Academy teams will operate from April 2018 to SEptember 2018. Our Under 12 Academy REP Teams play their outdoor league games in the Ontario Academy Soccer League. Please contact SSE 90 for further information regarding our Under 12 Academy REP Team.